In recessions banks tighten their lending standards. Therefore, the Fed’s January Senior Loan Survey that showed the banks started to tighten standards is worrying investors. The net percentage of banks tightening commercial and industrial loans became positive in January. It went briefly positive in 2012 and 2016, which were the other two slowdowns in this expansion. 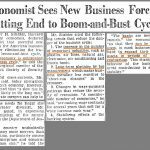 Therefore, this survey is far from a confirmation that the economy is in a recession. The net percentage of domestic banks tightening their standards for consumer loans has been mostly positive since 2017. The highest percentage is credit cards, but it’s nowhere near the level reached in the last recession, and it’s not at the level hit in the 2001 recession yet. As you can see from the chart below, the net percentage of banks increasingly willing to make consumer loans fell to near zero. It’s pretty easy to see why the January survey showed banks not increasingly willing to make loans. Financial conditions became very stressed in late 2018 before recently recovering. We’ve previously seen surveys which showed the banks were worried about the yield curve. The Fed could invert most of the curve with one more hike. The percentage of the curve that is inverted has increased. There are also worries about the trade war and government shutdown. Global growth is also slowing, especially in Europe. The consumer is in good shape as the unemployment rate is 4%, and in Q4 2018 real median usual wage growth was 2.9% which was the strongest growth since the start of the cycle. 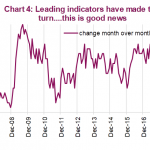 Redbook same store sales growth is in the mid-single digits although it has pulled back from the cycle high reached in December where it was in the high single digits. As you can see from the chart below, household debt service payments as a percentage of disposable personal income was 9.82% in Q3 2018 which was the lowest percentage since at least 1980. The consumer deleveraged during and right after the financial crisis and hasn’t taken out more leverage since then. Debt won’t hold back consumers from spending. The biggest impediment to consumption growth probably would be weakness in the labor market. With the labor market strong and consumer leverage low, the banks should keep giving out loans in 2019. Since we are reviewing whether the consumer will be able to keep borrowing, let’s look at the latest data on consumer credit. In November consumer credit was up $22.4 billion; it was up $16.6 billion in December which slightly missed estimates for $17.5 billion. Non-revolving credit, which is student and vehicle debt, was up $14.8 billion in December after increasing $17.6 billion. In Q4, student loan debt was up 5.3% year over year which was almost the same growth as the previous quarter. 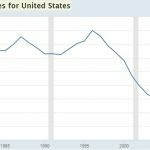 Student loan growth has been declining for years which isn’t a surprise because it would have encompassed the entire economy if it kept growing at the rate of the low to mid double digits it was growing at from 2007 to 2012. Revolving credit, which is credit card debt, barely increased in December as it was up $1.7 billion after increasing $4.8 billion. Total consumer credit reached above $4 trillion for the first time in December. As you can see from the chart on the right, quarter over quarter annualized consumer credit growth increased to 6.6% which is one of the faster growth rates of this cycle besides the extreme growth after the recession which had very easy comparisons. Year over year growth was 4.7% which is below the average since 1990. However, it should follow the increase in the quarter over quarter growth rate if that growth sustains itself for the next few months. Not only are consumers not leveraged, the debt is being issued to consumers with high credit scores. 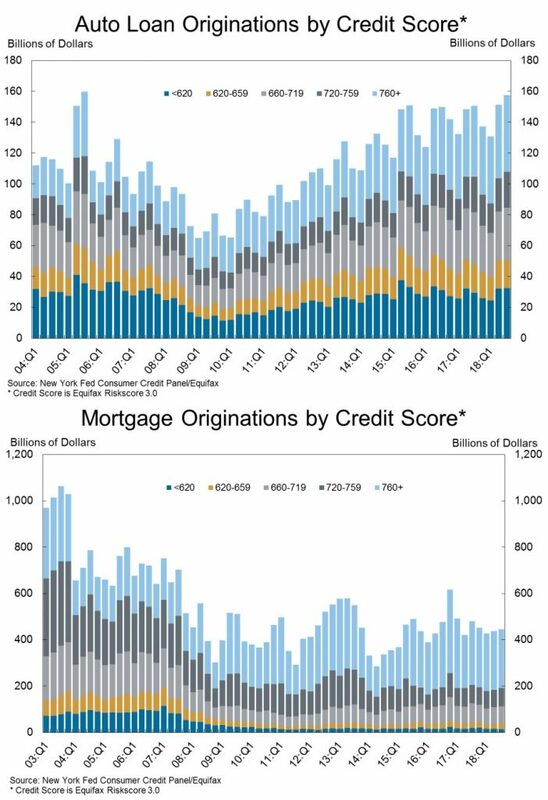 As you can see from the charts below, the median credit score for private bank loans is about 705 for autos and about 760 for mortgages. The banks have been very risk averse this cycle. It’s questionable what would happen if the banks pulled back from lending. They aren’t easy now, so what more can they do other than shut qualified borrowers out of the market? Shutting them out is an obvious mistake that would only occur in a terrible recession where financial conditions were stressed. 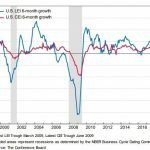 Consumer spending growth should be strong in 2019 because the labor market is the fullest of this business cycle, wage growth is accelerating, and inflation is modest. The chart on the left suggests this potential is being realized. In December, the consumer credit impulse hit a 4 year high. Private consumption growth has also been accelerating. We will update you when the Personal Income and Outlays report comes out on March 1st (if the government isn’t shutdown). Consumer confidence fell in January because of the government shutdown and stock market volatility. It rebounded last week from 57.4 to 58.2 as you can see in the chart below. The index was up in 3 of 4 regions. It fell in the West and was the highest since 2000 in the Midwest. It increased for all age groups except ages 35-44 where it fell for the 3rd straight week. Sentiment fell for Democrats and Republicans, but rose for Independents. This index should increase further if the government avoids another shutdown. The deadline to make a deal to avoid a shutdown is February 15th. The banks pulled back from lending slightly in January. The good news is consumers want to borrow and have low leverage. Their confidence is rebounding as the government shutdown is over and stocks have increased. The Redbook survey showed same store sales growth was strong in December. Let’s see what the personal income and outlays report shows. The banks are already only giving out home and auto loans to the best borrowers, so it’s tough to see how they can pull back further without abandoning qualified buyers. That would only happen in a major financial shock.